Glossary of Fun Cosplay and Fandom Terms….Ongoing! Updated Regularly! In July of last year, I was in RTX with Kiogenic. It was her senior trip. I had registered for the convention, but never actually went in- the line to pick up badges was CRAZY, and I had too much fun talking to cosplayers in line. This cosplay was exquisitely made, ultra-detailed and eye-catchingly different. A beautiful example of creative cosplay, in this case, of melding two franchises. The young woman on the right, Mangoloo was the artist in this case, and was kind enough to talk to me about her enthusiasm and process. I’m grateful, as her willingness to share was also extremely useful in the academic cosplay work that I’ve completed since as well! Therefore, I hope she’ll forgive me for this profile taking so long to post. Do you have a “day” job? : I definitely do! How long have you been cosplaying? : I’ve been cosplaying for about 5 years now. What’s your home base? :I’m based in Vienna, VA. There are many different factors that I consider when choosing a character to cosplay. A big factor is if I can relate to the character. For instance, Ruby from RWBY – I can easily relate to her sweet derpy personality. I also look into the design – I particularly like challenges so I tend to choose more difficult cosplays, for instance, Final Fantasy’s Serah Farron. Overall my love for the character is what motivates me to make the cosplay for it. I think more often I identify with my character because I spend so much time doing character studies and trying to get into the head of the character so I can accurately roleplay as them by the time the cosplay is done. I think most people know me from my RWBY Ruby Rose cosplay. Although if I personally had to choose a favorite – I can’t say that I necessarily have one because I love all my cosplays differently. Each cosplay came with different challenges that I had to figure out how to overcome and new techniques that I had to learn. I am proud of the outcome of all my cosplays; therefore, each cosplay has a special place in my heart. Primarily I make my cosplays because I enjoy the challenge. Although I have bought/modified a few more causal ones. The best thing someone could say about my cosplay is complimenting my detail work. I take huge pride in the small details. As for the worst – I would say if someone makes a comment that isn’t constructive. I am all for constructive criticism. Can you elaborate on the “character studies” you do? What does that consist of? Character studies consist of anything from memorizing quotes, learning the backstory, learning speech patterns, etc – essentially anything to help me get to know the character better so that I can better get into the head of the character when I go and roleplay as them. Check out Mangoloo’s amazing work on her Facebook Page, Tumblr, and consider booking them by emailing: LMcosplays@gmail.com. Now Available on Amazon! Only $6.99! 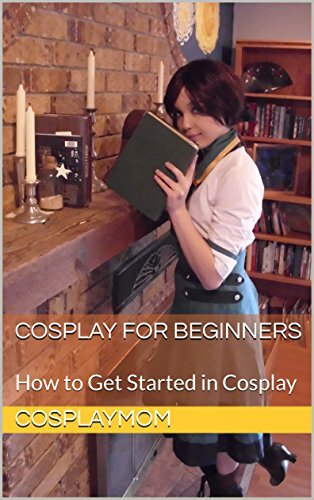 : Cosplay for Beginners- Hints, Tips and Techniques! We're so proud of this book! Kiogenic and I wrote it together to give everyone our best hints and tips on how to get started in cosplay ON A BUDGET. It's now available on Amazon! Only $6.99 for the Kindle version!